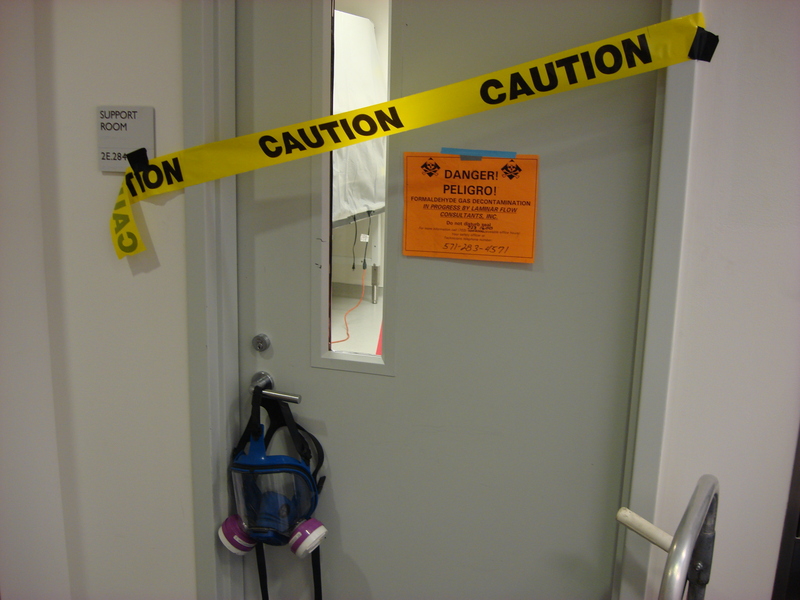 LFC has been decontaminating suites and equipment for more than thirty years. Formaldehyde gas has been the industry standard since the invention of the biological safety cabinet. Recently a series of alternatives have arrived that will provide a safer decontamination gas. We carefully reviewed the two major alternatives which are vaporized hydrogen peroxide (VHP) and chlorine dioxide (CD). We read that studies with VHP showed a poor ability to penetrate materials. If an organism were left under a pile of papers or other material VHP would not reach it because it is a vapor and not a true gas. This makes VHP a good candidate for decontaminating empty animal rooms and plastic isolators, but completely unsuitable for BSL-3 labs. CD does not have these limitations, but CD generators were just reaching the market. We conducted simple experiments during our first few CD decontaminations. We placed biological indicators using bacillus atrophaeus in a number of difficult to reach spaces and found that CD penetrates as well as formaldehyde without the bad smell and cancer risk. We strongly recommend this agent for space decontamination. See the Clordisys website for CD details, or call us for a quote.